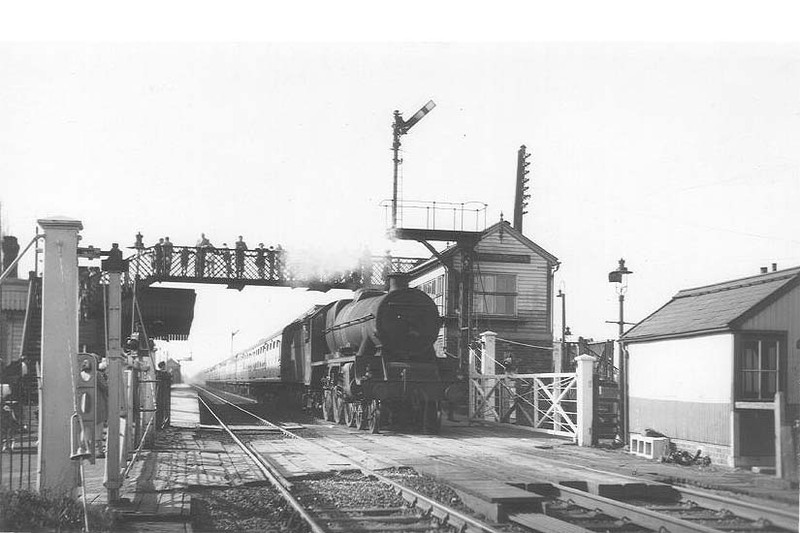 Ex-LMS 4-6-0 Jubilee class No 45587 'Baroda' is seen at the head of an up express as it passes over Marston Green level crossing on 24th April 1954. The signal box at Marston Green was positioned on the up side and was of standard height, much lower than the signal box seen at Tile Hill. The son of the photographer, Mark Norton, has always wondered what was the attraction with so many people either on the footbridge or standing by the gates. Built as LMS No 5587 by the North British Locomotive Company in December 1934 it remained in service until December 1962 when it was withdrawn from Carnforth shed and was finally scrapped during September 1963 at Horwich works. Jim Shaw writes "I don't know if there was anything special going on but I remember visiting Marston Green many times as a child during the period 1954-60. That particular day was a Saturday and if the weather was fine it was a popular walk from Birmingham out via the playing fields to the station. I always remember lots of train spotters whenever I went too. In those days there would have been a lot of pedestrian traffic and quite a number would gather at the gates or if they were 'brave' use the footbridge. The passage of any train seemed exciting in those days. As kids we might play on the field to the south of the station and then rush for the bridge when word came that a train was due. My memory was that road traffic wasn't at all heavy even by the standards of the time so it wouldn't have been at all unusual for people to 'man' the gates".